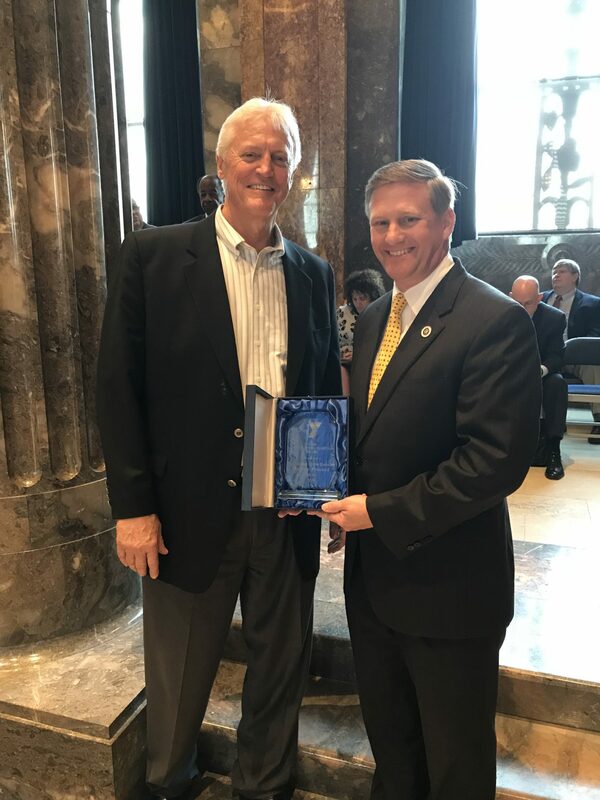 [May 15, 2018 – Baton Rouge, Louisiana] Sen. Barrow Peacock was awarded the YMCA Senator of the Year on May 15 in a surprise presentation at the Capitol. Gary Lash of the YMCA of Northwest Louisiana joined YMCA representatives in Baton Rouge to present the award. Senator Peacock is recognized for his advocacy and support of the YMCA’s mission. Peacock helps run the YMCA athletic scoreboard when not in session. “Now I have a trophy like my sons,” he joked. May 15 was also designated “Y Day in Louisiana” to honor the organization’s commitment to nurture the potential of kids, promote healthy living and foster a sense of social responsibility. The Y’s core values of caring, honesty, respect and responsibility unite a movement and guide behavior, interactions with each other and decision-making, Lash said. strategies for serving children and families. Louisiana’s Ys stand ready to support state government efforts to provide developmental programs for youth, strengthen families and mobilize and coordinate broad efforts to support children and families through partnerships that meet community needs, the resolution said. Representatives of Louisiana’s Ys also met with legislators in Baton Rouge to discuss and exchange ideas on issues facing youth and families.